In between feeling like hell, I am happy to report that I have done SOME stitching. This little amount was a push. 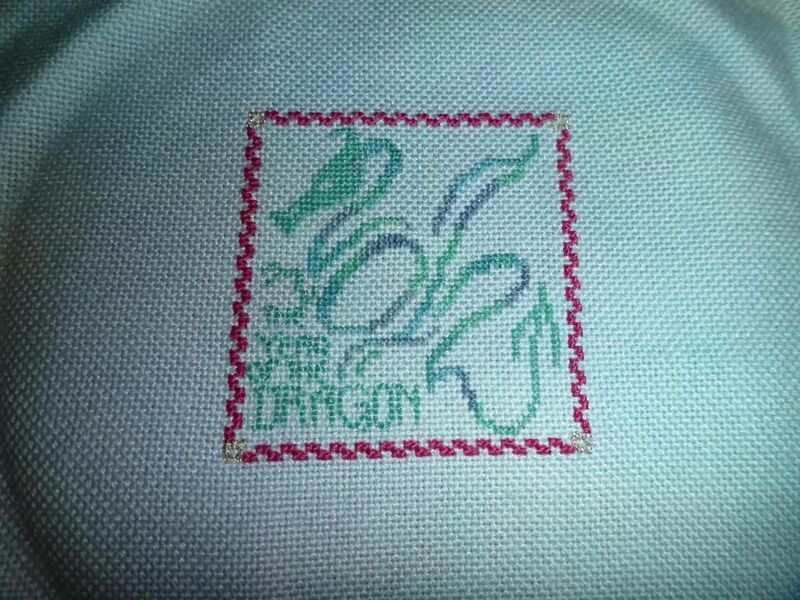 I started and finished a new ornament, I wanted the 2012 Just Cross Stitch Ornament Collection just for the dragon dreams ornament. It's done on 28ct polstitches fabric over one. It is tiny. Only about 2-3 inches wide. Since I haven't been feeling the best I haven't been feeling great when stitching. My head has been hurting when I tried to concentrate so I turned around and started making crocheted Christmas ornaments from Planet June. I LOVE that website! So many cool patterns. I think I will be making a number of these. I have added some sparkle in the middle one, I used DMC metallics one strand in the red. You can just see the glitter of gold. There are seven all told that I have finished though I plan to do many more. They only take a couple of hours to finish and I think they will make good presents. I am feeling much better today. Which is great! I hope I continue to feel better. Those are all lovely ornaments, congrats! wow they all so sweet..
Love all your ornies! Glad you're feeling better! That dragon ornament is so cool! I can see the year 2012 in his body. 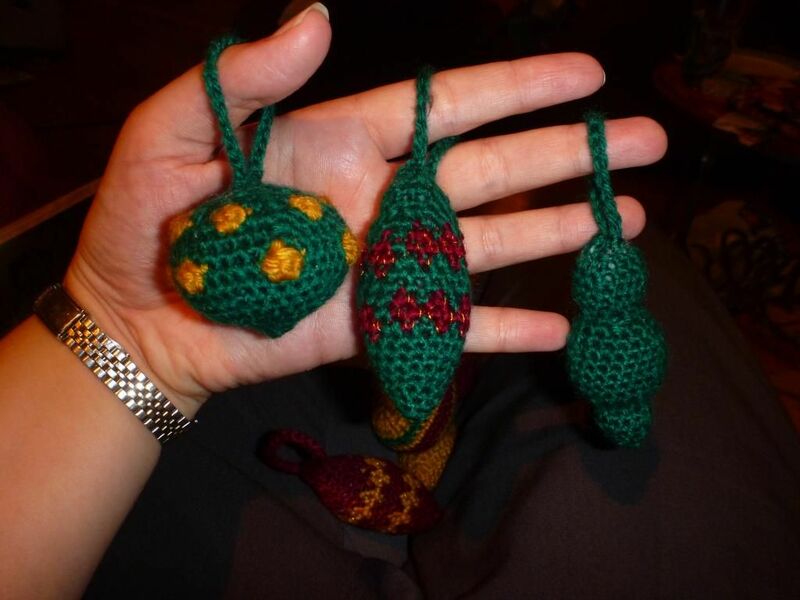 Your crocheted ornaments are fantastic! They will be awesome presents. Imagine, I love the dragon! 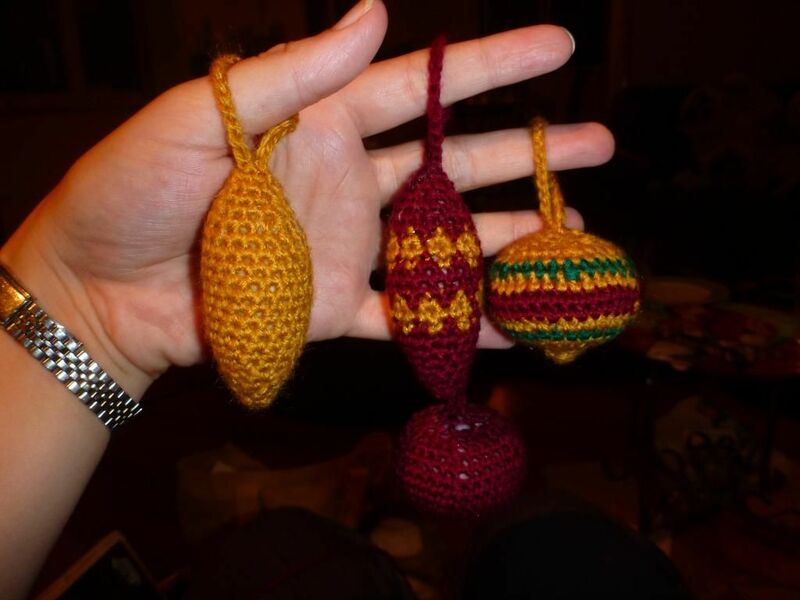 Your ornaments look great, not sure which one I like best - now I think I need to learn how to crochet. The dragon ornie is awesome...love the way his body makes the year! Cute dragon ornament. Love the crochet ones. Can you send me the link to the patterns. Oh I love the crocheted ornaments! They look great.